Think how your washing machine reacts when your clothes shift to one side of the tub. As the load becomes unbalanced, the tight circular pattern of the spinning tub begins to widen and take on an oval shape. The normally smooth operation of the washer is disrupted and the machine becomes less efficient. (And then there’s that “lopsided” noise.) A tire that’s not properly balanced will behave basically the same way. Blemishes or other acceptable variations in the tire’s sidewall or tread. Repair work: patches and plugs. Uneven tread wear on one side of the tire. They can all affect a tire’s weight and throw it out of balance. That’s why accurate tire balancing is necessary for your vehicle to perform its best. 1) Noise: Just like your washing machine makes a distinct sound after the clothes shift to one side of the tub, tires will often get noisier when they’re out of balance. 2) Vibration: Because it’s not spinning in a tight circle, an unbalanced tire can literally bounce down the road. As a result, you may notice declines in speed, handling, and fuel economy. 3) Appearance: As you check your tire pressure once a month, look to make sure all your wheel weights are still in place where the rim meets the bead of the tire. If one or more have fallen off, chances are good the tire is no longer in balance. Another visual indicator that you may need tire balancing is uneven tread wear. Your tires must be balanced each time they are mounted on wheels. And because tires can be thrown out of balance over time, it’s important to have them checked regularly. We recommend about every 6,000 miles. Here’s a good rule to keep in mind: whenever you have your oil changed, ask us to check your tires for balance, and then rotate them. Unbalanced tires can also cause excessive wear on your shocks, struts, and other steering and suspension components. 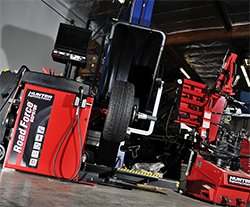 So, by treating tire balancing and rotation as scheduled maintenance, you’ll not only extend the service life of your tires, but your vehicle’s related parts and systems as well. When combined with proper wheel alignment, tire balancing improves your vehicle’s ride, handling, efficiency, service life and safety.